More than $6 million from the Microelectronics Advanced Research Corp. and the Defense Advanced Research Project Agency (DARPA) for continued support of the Center for Low Energy Systems Technology (LEAST), which is directed by professor Alan Seabaugh. A $2.4 million grant to professor Matt Bloom of the Mendoza College of Business to study faith and flourishing at work from the Templeton Religion Trust. A $1.78 million award from the John Templeton Foundation to professors Celia Deane-Drummond and Agustín Fuentes from the Departments of Theology and Anthropology, respectively, to research human distinctiveness, including an associated summer seminar for theologians in evolutionary anthropology. 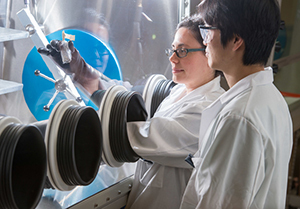 More than $6.6 million from the Department of Energy to professor Ian Carmichael in the Radiation Laboratory for continued research into radiation chemistry and photochemistry in the condensed phase and at interfaces. This project has been awarded more than $51 million since the current phase began in 2004. In addition to these awards and others from the Colleges of Arts and Letters, Business, Engineering and Science, faculty from the School of Architecture, the forthcoming Keough School of Global Affairs and the Law School contributed to the total as well. For more information, visit research.nd.edu or @UNDResearch. Originally published by Joanne Fahey at news.nd.edu on September 16, 2015.